A Victorian wool sampler by Eliza King of Carmarthen in 1859 in an oak frame. 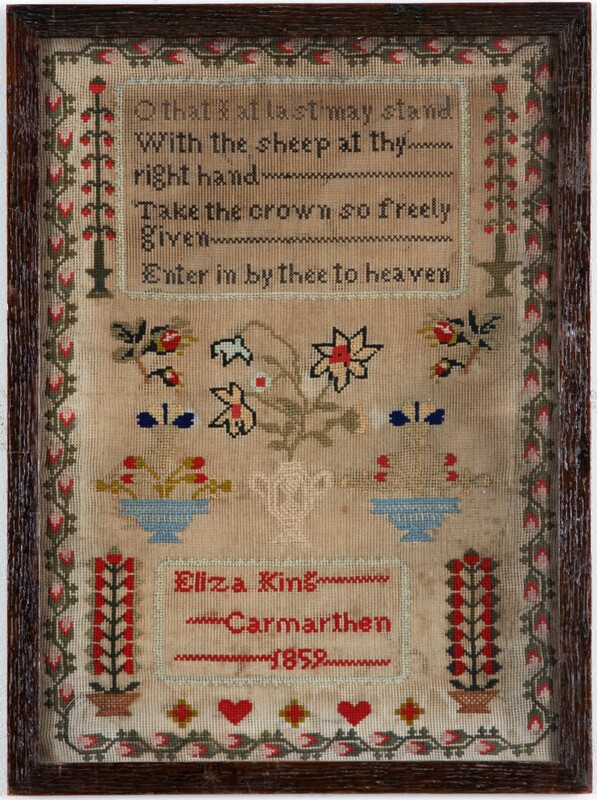 from page 24 – Carmarthen sampler by Eliza King, only child of William, a woolweaver from Waterloo Trreace and his wife Ann. The text is the final verse of a hymn entitled “Happy soul that free from harms” from John Wesley’s “Collection of Hymns” first published in 1780.
from page 25 – It is a fanciful notion, but perhaps the two girls were both pupils of Wood’s Row Sewing and Reading school, which had been established in 1840 and run by a former milliner. Woods Row is a stone’s throw from each of the girl’s homes. 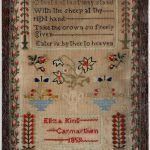 The 1847 report stated that the “Schoolroom (was) filled with respectable girls and few boys….Elder girls worked samplers which appeared very good…Both teacher and taught appeared extremely happy together.